We are pleased to announce the launch of a new website for the program &Geidai: Human Resource Capacity Development Program for Arts Project in the Global Era, which Professor Sumiko KUMAKURA, Dean of our Graduate School, undertakes as General Manager and Artistic Director. Events related to &Geidai will be announced on the website below. 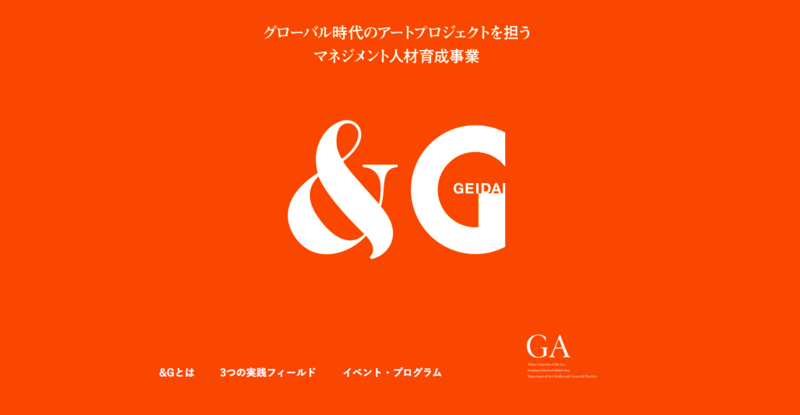 &Geidai is an art-management capacity development program organized by Department of Arts Studies and Curatorial Practices at Graduate School of Global Arts, Tokyo University of the Arts (TUA), under the total direction of Professor Sumiko KUMAKURA, Dean of the School, with the focus on “art project in the global era”. The program aims to develop global perspective among arts managers while at the same time building solid skills and experiences to work with local communities. Participants will work closely with the three existing art projects in Senju, Ueno & Yanaka, and Toride, as their field of learning. This program has two parts; “Global Perspective” will introduce the latest theories and case studies from across the world through international symposiums and lectures by inviting guests from abroad, while in “Theory and Practice”, participants will join one of the three practical fields to have hands-on experience of managing the arts programs. These experiences will be shared, reflected and theorized in the Exchange Lab, which will be held twice a year in summer and winter, where participants from all the fields gather at one place to discuss their learning. * Program will be held mostly in Japanese due to the nature of community-engaged programs in the specific areas of Japan. If you are interested to visit some events, please contact us through Email below. ◎ College students aiming to be experts in the field of arts management in the future.